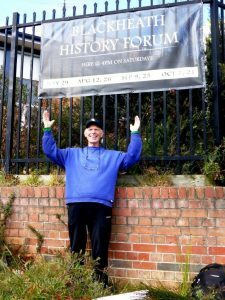 Blackheath History Forum Committee chair, Dr. Gary Werskey celebrating the arrival of our new banner! Our Facebook Page will keep you up to date with all our events, and speakers. We also aim to provide you with a range of interesting posts focussing on all things history. We will soon be adding blog posts to the Blackheath History Forum site. Please watch this space!